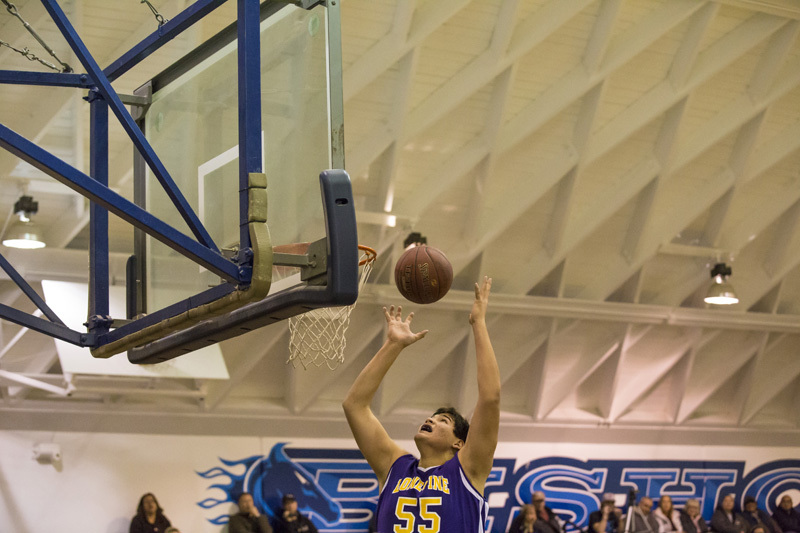 The Broncos took the first 3 games on Friday but lost the night cap as the varsity boys fell 69-43. With wins the varsity girls and JV boys stay unbeaten in high desert league play. Bishop high will wrap up the regular season with back to back home games this Tuesday and Wednesday. 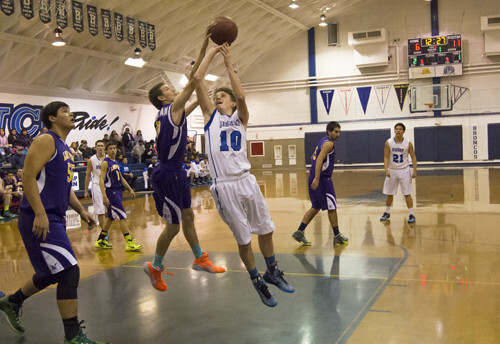 Bishop will host Frazier Mt Tuesday then host rival Kern Valley Wednesday. Thomas Montoya 14, Sean Brown 9, Dru Allen 7, River Mallory 4, Jake Traynor 4, Brandon Forrest 3, Ty Tucker 2. Little Eva Lent 25 points 7 steals, Tamia Shoshone 11 points 6 rebounds, Topah Scherer 9 points 5 assist, Maria Jimenez 4 points 9 rebounds 5 steals and 5 blocks, Sophia Thomas 3 points, Cienna Martinez 2 points. Mike Molina 13, Trace Sapp 7, Anthony Vega 7, Carson Eldridge 4, Moran West 4, Tommy Ruelas 2. Kassidy Ducky 14 points 4 steals, Michelle Toledo 8 points 7 steals, Julie Cepeda 7 points 3 steals 5 rebounds, Gracie Soto 2 points 5 rebounds, Faith Manriquez 4 rebounds. The quest for the High Desert League title will continue for the unbeaten Bronco girls soccer team after a 0-0 draw at Frazier Mt. 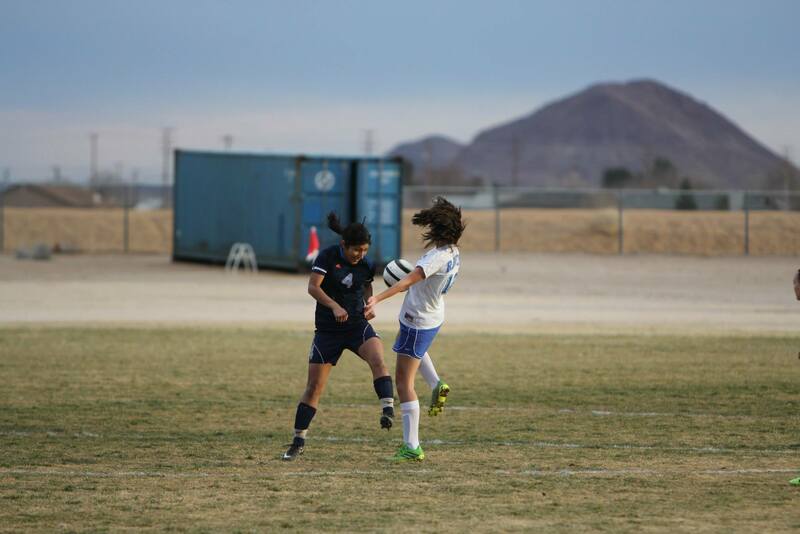 Bishop’s varsity girls are 6-0-1 in HDL play one game in front of the Falcons. Bishop can win the HDL title with a win or a draw when they face off with rival Kern Valley Thursday. The game will be played at the Hart Soccer complex in Bakersfield due to work being done at Kern Valley’s home field. According to Bishop Coach Manny Terasas the match with Frazier was a back and forth affair most of the game. Terasas indicates that the broncos had two shots hit the post in the final 10 minutes. The coach says, “Yessi Lara had a great game with five vital saves as goal keeper for a shut out. The best player of the field by far was Ritz Garcia, she won every 50-50 ball.” Bishop had 15 shots on goal, none finding the back of the net. The Golden Eagles magical season continues with a championship clinching win over Desert High School. The 58-44 win at Edwards Air Force Base moves Lone Pine to 13-0 in Desert Mountain League play and 22-2 overall. Center Brad Greene returned from injury providing a huge lift. Greene scored a team high 26 points and pulled down 19 rebounds including 8 offensive boards. Greene had been out with injury, but now rejoins the team at this pivotal time. Lone Pine wraps up the regular seasons Thursday at Silver Valley then begins the post season the following week. This week Lone Pine is ranked #8 in the CIF Southern Section Division 5A poll. Lone Pine is the top public school in the top 16 poll….and the only public school in the poll. Brad Greene 26 points, 19 rebounds, 6 blocks, Garrett Sullivan 11 points, 4 rebounds, 3 assists, 3 steals. Preston Huerta 8 points, 3 rebounds. Ryan Cappello 7 points, 6 assists, 4 rebounds, 3 steals. Kishan Bhakta 2 points, 4 assists, 3 rebounds, Bryce Scott 2 points. Adrian Gonzalez 2 points. Soph. 132 lbs. Tanner Otteson – 2nd place (32-10 record for the season) **Took 3rd at The State Championships last season 109 lbs. Senior 285 lbs. Kyle Dennis – 2nd placeThe State meet will be held in Winnemucca. Tonopah finish 8th place as a Team with a total of 57 team points. State Championships are in Winnemucca, NV this Friday and Saturday February 13th and 14th . Hosted by Lowry High School at the Winnemucca Indoor Event Center/Complex. photo and recap provided by Robert Otteson. The Bishop Union High School boys and girls varsity soccer teams dominated California City High school winning 7-0 an 3-0. 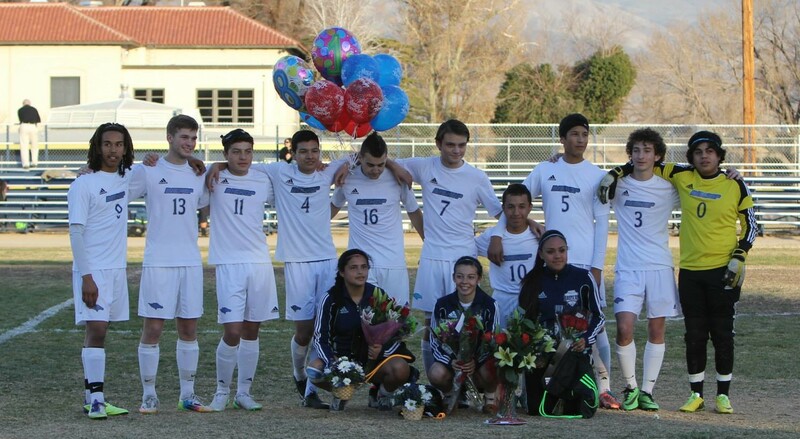 Bronco seniors were honored Thursday at the final home regular season match. While the teams dominated on the field, the day was marred by an ugly ending with two bronco boys receiving red cards in the final minutes of a 3-0 victory. The senior girls honored Thursday: Brenda Gonzalez, Evelyn Santana, and Alicia Campos. The senior boys: Jarod Dossey, Elijah Alexander, Alex Gonzalez, Jose Mendez, Hector Santana, Joey Griego, Christian Sandoval, Erik Santana, Joe Domke, Daniel Martinez. The girls won 7-0 with three goals in the first half and four goals in the second half. The graduating seniors contributed heavily to the score line, Alicia Campos scored first with a goal from a great corner kick. Brenda Gonzalez came away with a hat trick with two goals in the first half and one in the second, and last but not least Evelyn Santana put in a great goal and had an assist. The other goals came from Sophomore Kailyn Boxley and Freshman Kiley Beard, with assists from Kristy Dohnel, Sara Voss and Kailyn. The Broncos hit the road heading into the last week of league. The Bishop varsity girls are unbeaten and atop the HDL standings. The Varsity Boys won 3-0. They boys game ended in an unfortunate confrontation, and saw seniors Elijah Alexander and Daniel Martinez sent off in the final minute of the match. The Broncos play next Tuesday, traveling to Frazier Mountain for their next High Desert League match.